Our guest contributor this week is Pat Barch, the Hoffman Estates Historian. This column originally appeared in the March 2018 issue of the Hoffman Estates Citizen, the village’s newsletter. The column appears here, courtesy of the Village of Hoffman Estates. 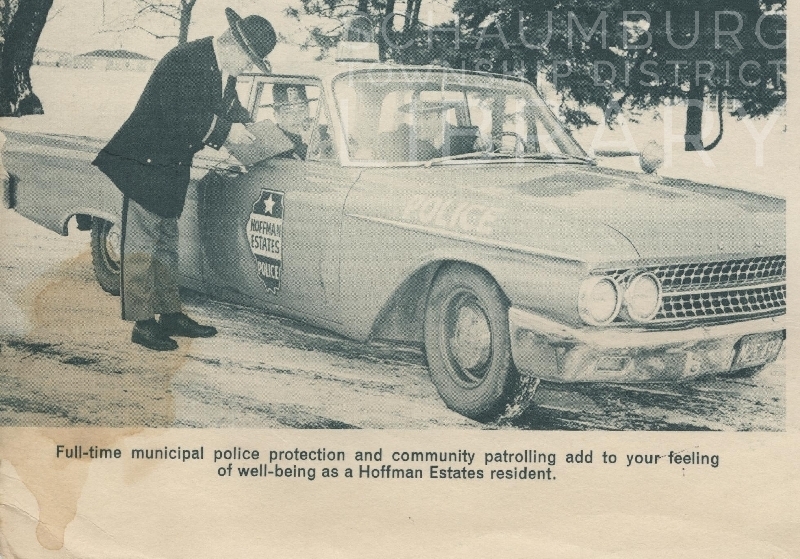 Fifty eight years ago, on March 17, 1960, Hoffman Estates installed its first police chief. The new police department would be headed by Mark Orlick, a 24 year veteran of the Highland Park, Michigan Police Department. His first order of business would be to hire new police officers. Starting salary for the new police officer/officers would be $4,800 for the first 6 months. It wasn’t certain that more than one officer could be hired due to budget restraints. New officers had to reside in Hoffman Estates for 1 year, pass all the physical exams, be between 5 ft. 9 inches and 6 ft. 2 inches tall and not be underweight according to the weight charts. Chief Orlick was prepared to get right to the business of serving the residents of Hoffman Estates. He brought police forms from the Highland Park, Michigan Police Department and a month’s supply of traffic tickets to see him through until he’d be able to print his own. He needed to purchase a Ford heavy-duty police interceptor cruiser with a special police interceptor V-8 engine. He had a Detroit dealer in mind but would also ask for a competitive price from a local dealer. Until the new squad car arrived, officers would drive their own car or a rental. Mark Orlick came to Hoffman Estates with an excellent background. He had organized the Hazel Park, Michigan Police Department, taught classes for the FBI, received 2 citations for bravery and completed a course in police study at the Northwestern Traffic Institute. He held the rank of Lt. Col. Infantry in the Michigan National Guard. One of the requirements for his position as Police Chief was to reside in Hoffman Estates. Until he sold his home in Michigan he decided to live at village hall. At that time it was the old Hammerstein Farm House that had just become our village hall. It’s not known how long he lived at village hall but he certainly was always available for any emergency situation and was working around the clock to get the new police department up and running. Our guest contributor this week is Pat Barch, the Hoffman Estates Historian. This column originally appeared in the December 2014 issue of the Hoffman Estates Citizen, the village’s newsletter. The column appears here, courtesy of the Village of Hoffman Estates. As I drive around town or back and forth to work, I notice that the police cars keep changing. Some are the 4 door sedans, but many are SUV’s of all types. It’s nice for our officers to have enough room in their squads to pick up a bike that’s been abandoned on the roadside after being stolen or damaged. They probably like having the extra room for other everyday work. Over the years the colors have changed along with the newer makes and models. I began to do some research into how our police force has changed over the years. 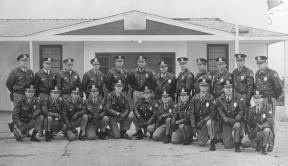 My first memory of the police department dates back to 1965 when I first moved to Hoffman Estates. The police department had a small area on the north end of the old Gieseke/Hammerstein farmhouse (now the Children’s Advocacy Center) that served as the first sales office for F & S Construction but later became home to our first village hall, public works and police departments. The north end of the upper floor was used for police offices. The slanted ceiling always required walking about in a slightly stooped position for police chief Mark Orlick who had his office upstairs. A small addition was added to the back of the farmhouse to serve as a small jail. Our population in the 1960 census was 8,296. The Daily Record newspaper had a 1962 story about the police department. At that time, the force consisted of the Chief Orlick, Lt. John O’Connell, Sgt. Willard Anderson and six patrolmen; Norm Kalovsky, Robert Manning, Ray Schneider, George Eckart, Rod Schwartz and Richard Hecker. The training for the officers was given at the Chicago Police Academy. There were only 3 squad cars to patrol the neighborhoods. Two squads were on duty at all times with all three on duty during the “rush hour”. Other duties of the police officers were to take accident victims to area hospitals (Arlington Heights or Elgin) when they didn’t need an ambulance. They served as armed guards for large monetary deposits from businesses or large organizations to Roselle or Palatine banks since there was no bank in town. They also served as marriage counselors for domestic disputes. During 1961 they handled 2,662 calls from residents. The most common were dog bites, prowlers and suspicious persons or vehicles. Since the early 60s, our village has grown from a population of 8,500 to 53,000 in 2014. Our village borders now reach west to Elgin and north to Inverness. There are 22 square miles for our police force to cover in their efforts to keep us safe. We now have 93 sworn officers, 31 marked cars, with 8 patrol cars on the streets at all times. Our police department took 19,339 calls from the community in 2013. Their 12 weeks of training is done with the Suburban Law Enforcement Academy at College of Du Page. They continue with 14 weeks of on–the-job training. The present day police force still helps us deal with domestic disputes, dog bites; traffic accidents, prowlers and suspicious persons, but they do it on a much larger scale. With modern communication tools, we dial 911 and they arrive on the scene or at our doors in a matter of minutes. It’s reassuring to know someone is there to help us. The question is: where in Schaumburg could you find a Western Store and the village’s municipal offices and jail housed in the same building? It all began in 1954 when Henry H. and Elvira Freise, long-time German farmers, sold their 160 acre farm to William E. Frank and his wife, Evelyn. The farm was located on the northeast corner of Roselle and Golf Roads in Schaumburg Township. Coming from the city, the Franks were considered outsiders but, in their hands, the farm remained a farm. They remodeled the old farm house for themselves and eventually built another home for their son, Bill, and his wife, Pat. Their first order of business, though, was to rebuild and repair some of the barns and outbuildings so that they could open for business as a working ranch. While living in Norwood Park, the Franks had owned riding horses and this hobby transferred well to the rural nature of Schaumburg Township. It became known as Sundance Acres Ranch. 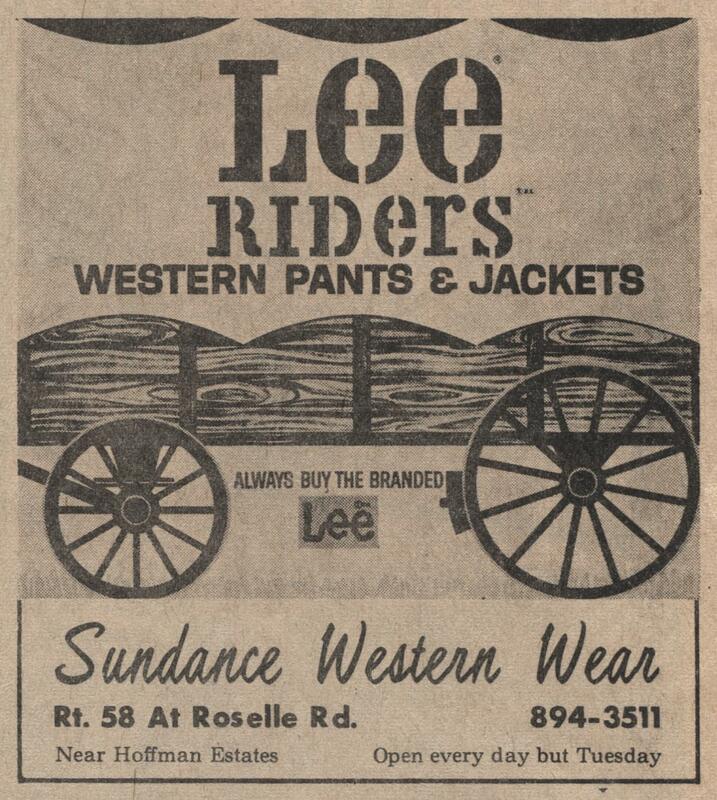 Later, in a number of places such as the ads shown below, it was shortened to Sundance Ranch. They raised, trained and boarded quarterhorses—their own and those owned by the public. According to the daughter of Mayor Bob Atcher, he boarded his horses, Golden Storm “Stormy” and Dakota at the ranch. The horses owned by the Franks were trained largely for cutting and roping and were shown at an average of 35 shows during the April-October season. They also gave riding lessons to the residents moving into the new subdivisions in Schaumburg Township. By 1957, 20-year-old Bill Frank was running the business. In 1960 he expanded it to include a Western Store that was housed in a third building on the property. 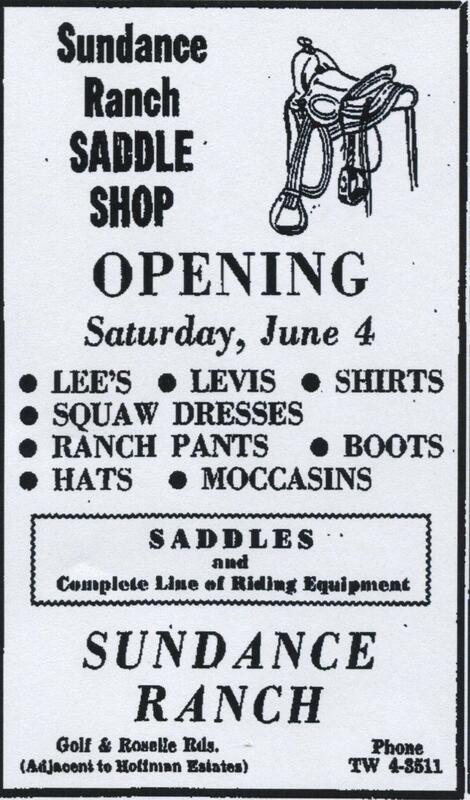 The Sundance Western Store was not only a saddle shop but featured a wide variety of men’s, women’s and children’s apparel. Everything from shirts, blue jeans, “frontier pants”, jewelry, “squaw dresses”, moccasins, chaps and riding jackets were sold. When Mr. Frank moved to the area, he had been involved in the construction business for years and was the owner and president of the W.E. Frank Company, Inc. as well as Charmaine Builders, Inc. Knowing a little something about building and development, Mr. Frank saw what was coming in the area and elected to run for trustee for the newly formed village of Schaumburg in February, 1956. He served on the board until 1963 and was instrumental in drafting many of the village’s first building ordinances and amendments that came later. His expertise was also invaluable in ironing out many of the details of the water and sewage utilities as well as the roads and sidewalks of the newly annexed Weathersfield subdivision. In early 1960 Mr. Frank must have offered the Western Store building to the village as a temporary quarters for their village hall and new, one-man police department. On March 15 Martin Conroy was hired as police chief and his police station—complete with no phone, no squad car and no lockup—was a room that was attached to the Sundance Ranch. In an article from The Herald (September 6, 1973) “Conroy said the one room served not only the one-man police department, but was used for board meetings and court proceedings.” He continues by saying, “We had to share the public toilet with the store. There was only one.” From April until December, village business was done at the Ranch until the headquarters was moved into a house in the new Weathersfield development at 100 Springinsguth Road. During the 1960s, according to numerable mentions in the Daily Herald, the ranch was heavily involved in the horse community. They sponsored horse shows, hayrack/barbecue parties and served as the grounds for the North Cook County 4-H Fair. Maybe some of you can help me out and relate your memories of the Sundance Ranch. Maybe you rode there, maybe you attended a birthday party complete with a hayrack ride, maybe you even have a picture of that party or maybe you knew the Frank family and can help with their unusual history in the Schaumburg community. Any and all information is gladly accepted! Information from the June 23, 1960 issue of the Hoffman Herald and an article written by Loie Wiley from an unidentified paper were used as background for this blog posting. Our guest contributor this week is Pat Barch, the Hoffman Estates Historian. This column originally appeared in the May 2010 issue of the Hoffman Estates Citizen, the village’s newsletter. The column appears here, courtesy of the Village of Hoffman Estates. 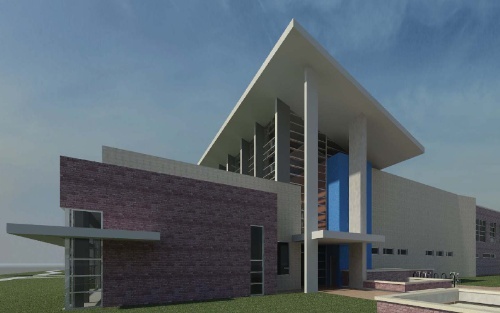 The beautiful new police department building on Spring Mill Drive will be opening this July. Its only 6 or 7 blocks from its original home on Illinois Blvd. That first police department was in the old Gieseke/Hammerstein farm house, now the Children’s Advocacy Center. 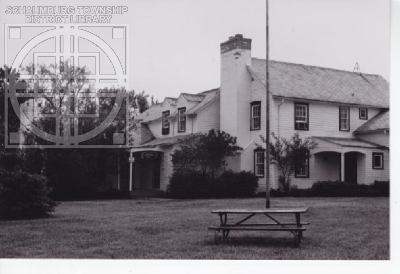 In 1959 the Hoffman Estates Homeowners Association turned the property over to the newly incorporated Village of Hoffman Estates and the 100 year old building became the first village hall and police department. They had only one makeshift jail cell in the back of the building. The old farm house had creaking floors and spiders in the basement. The Hoffman Estates police didn’t have radio contact with one another nor with the officer back at the police desk. The only way they knew that a call had come in was to regularly drive past the farm house and see what was happening with the front farm house window. If the window shade was up, they could continue on their rounds but if they saw that the window shade was pulled down, they’d better stop in and see who needed them. They didn’t have car radios installed until 1967. There were only 10 men on the force. Mark A. Orlick was the first police chief. Grey and navy were the first uniform colors. Over the years, black shoes were the only consistent part of the uniform as it changed in the 1960s, 1980s and again in 1999. The first squad car was navy blue and the squad car colors have changed more than the officer’s uniforms. We’ve had light blue, dark green, two-tone light green and white, navy blue again, all white and now black and white. The top red bubble light has gone to the more streamlined Mars emergency light. A new village hall was needed after more than a decade in the Hammerstein farm house. On June 25, 1972, the new 31,000 square-foot building was dedicated. It was the first municipal building in Illinois that was completely accessible to the handicapped. It must have been a wonderful change from the old farmhouse. The force was up to 32 men in 1972 and the new police facilities could handle 90 men and women. Over the past 50 years we’ve moved from window shades to lap top computers, from spiders in the basement to grass on the roof. P.S. I wonder who gets to cut the grass.